80 years after the nanopocalypse, Earth is mostly ruins. It's up to you to rebuild civilisation in this stark new world, using the few scarce resources you can find. Of course, other post-humans have the same idea, so it's a race to see who can build up their colony first. 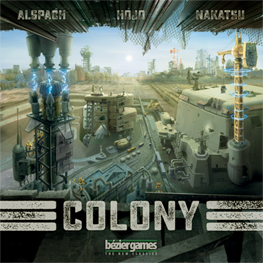 In Colony, each player uses dice as resources to dynamically acquire new buildings (cards) that provide unique capabilities, such as increased production, resource manipulation, and victory points. This highly interactive engine-building game is different every time, and the included variable card buildings ensure that no two games will ever be the same.